My husband came through the operation well, now it is just waiting for the results. It just looks so uncomfortable. The dressing is right up against the eye, and has been stitched on. The plastic surgeon said no dressing would stay in place otherwise. In the hospital she said we would come for an appointment next week Thursday – the 27th. The rooms phoned this morning and said Monday the 24th. Go figure. They can’t be taking the stitches out, it’s less than a week after the operation. Knowing my luck, it will be both days. With a 200 km round trip each time. This must be one of the worst times of the year to be doing this – it’s so full of holidays and half the time people you need to see are away. I’m really not in the Christmas mood, what with one thing and another. However, I really don’t want this blog to turn into me wailing in the wilderness, so let’s change the subject. It has been quite a hectic year. We had our car stolen, right out of the school parking area. My classroom faces the parking area and I can see the car from my doorway. Looked out between one class and the next and the car was gone. It was insured, but we had to add money to get another vehicle. A little hatchback. Lighter on petrol, at least. It’s only a 1 liter engine. My brother would have called it a motor-bike with two extra wheels and ambition. I am keeping on with the handwork – surprisingly soothing in times of stress. Busy on another jersey for my husband. I’m not liking the wool. There are uneven areas and I can foresee problems. I’m doing some crochet as well. 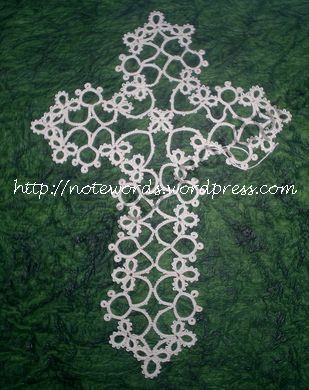 So fast compared with tatting. I have a side project with tatting. Some years ago I tatted a pot plant for a friend of mine. The pattern is on Homemade by Meta. I liked it, and am busy with one for myself. A very simple pattern, so it is a good carry-around project. In other words, not easy to mess up if you are not concentrating. 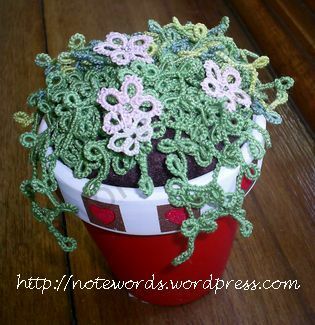 It is odd how small the tatting thread in comparison with knitting and crocheting. It’s size 20 and I have used 100 before today. (The higher the number, the finer the thread) This is Ben Fikkert’s Josephine Cross in 100 thread. A great site to visit. The pattern is there, although I don’t seem to be able to link directly to it. Look under ‘Galleries’ and then ‘Other Stuff’. Perspective is everything, really. Shakespeare said ‘There is nothing either good or bad, but thinking makes it so’. I can say, ‘What a terrible year, our car was stolen, my husband has even more health problems’, or ‘The car was insured, we got another vehicle. Maybe we caught the Melanoma in time’. So on we go. Blessings and best wishes over the holiday season, however you celebrate it (or don’t). We saw the plastic surgeon today. Because it is so close to the eye, she will have to do a skin graft. My husband will be going in on the 18th. He will be walking around over Christmas with a big dressing on his face. Anyone says anything humourous and I am likely to spit in their eye. She sounded pretty sure that the Melanoma hadn’t spread. I don’t think I will relax until everything is over. I’m assuming they will send what they cut out away for analysis. We will go back two weeks later for the post-op check up. I suppose we will hear the final result then. I’m going to have a fun festive season… My husband doesn’t seem to be concerned. I’m glad for him – stress doesn’t do him any good. Thanks so much for all the comments and good wishes. Each and every one is appreciated. This is just a quick post asking for thoughts and prayers for my husband. He has been diagnosed with a melanoma. Present indications are that we caught it very early, and that it has not spread. He will be going to the plastic surgeon on Monday, hopefully to have it completely removed. We won’t know for sure if we caught it in time until it has been removed and tested again. They have already tested a specimen. During the Spring of this year a friend told me about the 1,568 Sawdust Hearts project. After the First World War, many men came home injured and suffering from shell shock. As part of their recovery they were encouraged to take up craft work. 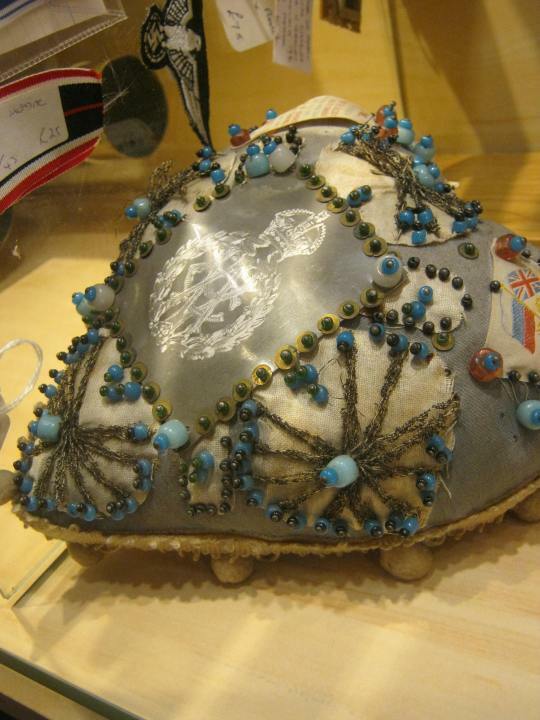 A popular craft was to make a sawdust heart pincushion for a loved one. Decorations were simple, and easy to do using pictures, pins and threads. Occupational therapy was born.This one was found in an antique shop this year. They say life is what happens while you are making other plans. Life certainly keeps happening, no matter what plans I make. Bronchitis, abscessed teeth and having to have our old dog put down. We only have one elderly cat left now, and the kitchen feels very empty at feeding time. At the recent Art Festival one of my pupils had a total disaster with one of her pieces. I was playing accompaniment for her and she started skipping bars. I couldn’t find her quickly enough for us to keep going. She was in tears. In all the years I’ve been teaching this is about one of the worst I’ve had. It’s nearly a year since my husband retired. At least he has been fairly stable on the medication. Last year this time it was ramping up to total crisis. I wouldn’t wish that on my worst enemy. In between everything I am still tatting and knitting, and trying to get somewhere with my writing. If I don’t do it now, I never will. If all else fails, I will just put my completed books out on the internet to take their chances. If someone reads them, well and good. If not, so what. I’ve been teaching guitar for more than 30 years. I teach at home, and was asked to teach at a local school in 2005. My Guitar. And some tatting. Pupil numbers do tend to cycle – when money is tight, people cut ‘luxuries’ like music lessons first – but the numbers always picked up again eventually. I’m still quite busy at the school – much better than last year – but I only have one pupil at home and she will be finishing at the end of this term. I’ve considered advertising, but if my husband’s health deteriorates, I will have to stop anyway. So I’ve decided to just let it go. We’ll just have to see about the school – the long term head of the music department left a year or two ago, and things haven’t been the same. In 2009 the orchestra competed in Vienna and obtained a third place. They were competing against orchestras larger than the entire school! My husband is going along. He is much better than he was at one stage, but his speech has been affected quite badly. He slurs his words and often can’t remember the name of things, for instance he said the other day he had to go for an injection, when what he meant was a blood test. He speaks softly as well, which compounds the problem. I am getting very good at guessing. We do usually get there in the end! 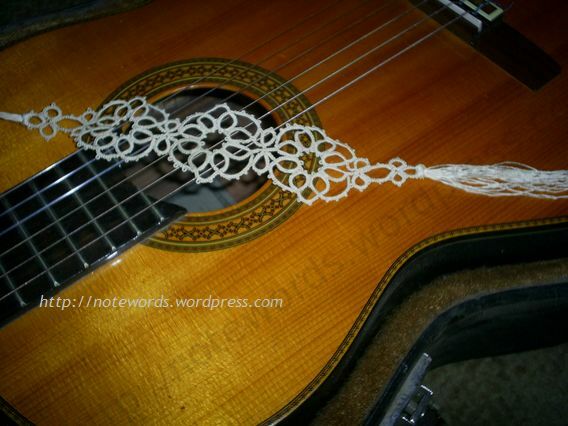 I’m still busy with knitting and tatting. Hopefully there will be some photos next time. The Iris Neibach doily has been the cause of much cursing! But it is going to be beautiful, and well worth the trouble.